This book started as handouts for an interior design class. During the writing, several events changed the focus to be more spiritual and include Feng Shui. It was brought into existence while my husband was undergoing radiation treatment for “Base-of-Tongue” cancer and my daughter and her husband were living with us. I now know that writing it was a gift for me to focus on the “good” in life helping us get through the challenges at that time. It’s an easy read with lots of suggestions on how to make a house become a “home”, reflecting the values of those living within its walls. From the back cover of the book: “Linda Lenore believes in the human potential, that we are here on this beautiful planet Earth to bring love and joy into the lives of people we meet. 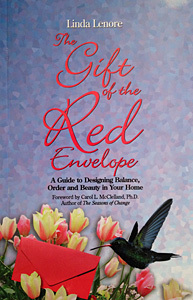 Her belief in the ‘Home’ as the sacred temple a place where we go to rejuvenate, rejoice, relax and recreate our lives, a place where we care for our body, the sacred temple that holds our spirit — is brought to life in this book to help you find the beauty in your home, yourself and your life.” Linda has learned the art of developing home and the human potential through education and life experiences. She has experienced life-threatening and disabling illnesses, the deaths of her mother and son within six months of each other and the divorce of a 23-year marriage. Her journey has led her to a deeper knowing of the importance and power of space, especially the metaphorical and symbolic qualities of humanness our homes generate with their beauty and sacredness. This book is only available at Linda’s presentations or by special order. Since several of the major sellers did not pay taxes to the local communities and with Feng Shui being very much about building the community, I decided to make this book unavailable for sale through the normal distribution channels. Under these circumstances it is highly unlikely for a book to reach the ‘bestseller’ status, and yet that is exactly what has happened with this book. Testimonial – “I bought this book when it first came out in 1998 and still love it. I bring it out every so often – reading and doing what comes up through the process. My husband and I both read it and based the design of our house on it. We love our home and how it has supported our relationship to it and each other.” – Karen L, Sacramento, Ca.